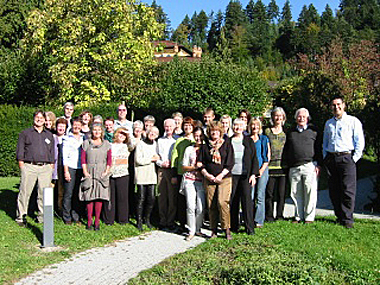 34 participants from 11 countries met in the very comfortable conference centre connected to the Convent of St Lioba in Freiburg. The outstanding feature of this Seminar was perhaps that there was a larger group of young teachers and a widening representation from new countries. Pauline Adams from the Netherlands replaced recently retired Golden Circle members. Serkan Guney and Sule Tepetas from Istanbul and Ankara described their interest in spreading Storyline in Turkey. Lea Nakrst has already created a Storyline Slovenia website. 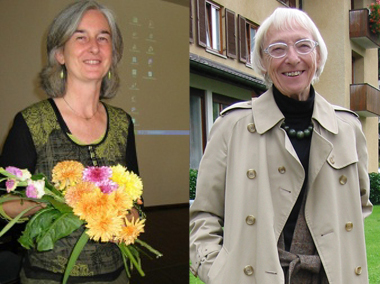 This development was balanced by the attendance of our old and dear friend Ingelise Jorgensen from Copenhagen, who struggled through ill health to join us, supported by her caring friend Anelise Birkvad. We are always thrilled with the support of the American contingent and Jeff Creswell & Todd Stewart Rinier of Storyline Design attended together with Jeff’s fiancé Caryl Menkhus. Wendy Emo from South Dakota University was also an active participant. It was great to have them with us. Marie Jeanne MacNaughton told us of her new research project Storyline in Global Education. Sharon Ahlquist from Kristianstad University in Sweden described her research on ESL teaching using Storyline. This also featured in the presentations by Gisela Ehlers from IQSH Kiel and Inga Riedel a young German teacher who talked about her experience of using Storyline in Hauptschule. Mait Adegard, a regular member of the group and now an adviser working for the Stockholm Education Authority was very active in the discussions as was her Swedish colleague Erik Lindberg, a Storyline tutor. It is always fascinating to hear from Cecilie Falkenberg, University College of Copenhagen, who described her design for a teaching training certificate for older members of the Royal Danish Ballet. Karen Margrethe Sorensen described the classroom results of a most entertaining topic about Emil (which has been developed in collaboration with Hanne Jacobsen who was not able to attend.) Edith Mark added to the strong Danish presence by representing the use of Storyline in nurse research and training and her husband Niels-Peter Lund Jacobsen has a special interest in religious education. It was good to welcome our two headteachers from England in the persons of Jill Wells and Lorna Karetnyk and also to have elder statesman Ulf Schwaenke with us from Hamburg. Ase Paulsen Skiftun a librarian and teacher in an Upper Secondary School in Kvinesdal was the sole representative from Norway and described her close Storyline association with Agder University. A very important programme item was the presentation by Gudmundur Kristmundsson and Bjorg Eiriksdottir of Iceland in which they told us of their plans for the 5th International Storyline Conference to be held in the University of Iceland, Reykjavik, from 9th to 11th August 2012. The discussion which followed was designed to provide ideas for the content of the conference programme. As the seminar was coming to a close Sallie Harkness thanked all the participants and paid tribute to Steve Bell who in the year 2010 has completed 50 years in education and coincidentally 50 years of marriage. Steve was presented with a book that contained tributes from his Storyline colleagues all over the world. Our hostess Doris Kocher had planned everything to perfection including cultural visits to places of historical interest and we are very grateful for all her hard work on our behalf. Freiburg is beautiful and we all felt that we had enjoyed a rewarding and stimulating weekend.